It is showing anticipated result for me. If anybody has any better idea then please share in the comment. When there was a need to show a serial no in Gridview on selected datasource then I was doing it in query (SQL Server) using ROW_NUMBER OVER() or RANK OVER(). But in the current project I am working on, needs some GridViews to be populated from XML datasource and some from manipulated/modified datatable. To these scenario I also can include another one, when you need to rows to be sorted in some order by allowing sorting in GridView and data of the to sorted from datatable. So, here I added an ItemTemplate to show the incremental Sl no. column. Following is the code for it. Here the value shown in the Sl no. column will start from the DataItemIndex (which starts from 0)+1 and so on.. Regarding performance, it is faster than former method and is a very convenient way to do so. Any communication process needs a sender, who sends the message (may be a request) and a receiver, who receives the message sent to him. This communication process may further progresses when the message sent is a request. Then most of the times, the receiver again responds to the request and sends a message (response) back to the other side. In a web application, client (generally a browser) plays the role of sender and sends the message (usually request for a page) to the server( web server). Then the server processes the request and replies with a message(requested page). For instance, when type www.suvendugiri.com in the address bar of the browser and press ENTER or click on the GO button, it sends a request to the server where the website is hosted. Here the request is to display the default page of my blog. Now after processing the request , server sends the response. Now the page is rendered to the browser in HTML format. 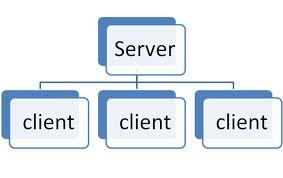 This type of communication is termed as client-server communication.